How Do I Buy a Boat with Why Boats? 1 How to arrange a viewing with WHY BOATS? Our team of brokers are in a position to offer the best advice in order to help you to choose a shortlist of suitable boats to match your requirements. When you are buying a boat, the viewing is one of the most important steps to help you decide if the boat is right for you. 2 How to make an offer with WHY BOATS? Offers on a boat can be negotiated direct with the vendor at the time of viewing, or you may prefer to use our services as skilled negotiators to help to close the purchase. It really depends on the relationship you may have established with the vendor, and your negotiation skills. Either way, all boats listed for sale with Why Boatss are eligible for this aspect of the brokerage service. Once we have helped you find your dream boat call one of our experienced brokers to discuss an offer and conditions which we will then discuss with the vendor. On signing of the contract a 10% deposit is taken and held in our protected client account. Deposits should be paid by electronic transfer but if you pay by cheque please allow 5 working days for the cheque to clear. 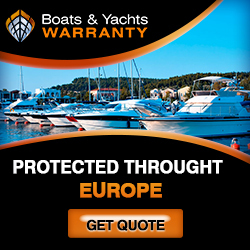 The Why Boats policy is always to recommend you have a survey of your potential purchase carried out prior to completing the deal. In some cases it may be advisable to arrange for a marine engineer to inspect the mechanical systems. Why Boats provide a comprehensive directory of qualified marine yacht surveyors and marine engineers. We suggest you contact a number of them to discuss your requirements and see who you feel most comfortable with. All yacht surveyors are affiliated to the Yacht Designers and Surveyors Association (YDSA) so you can be confident that they are suitably qualified, experienced and insured to inspect your potential purchase thoroughly. Some surveyors will be happy to arrange a survey lift on your behalf with a convenient boatyard; otherwise the vendor may be able to help with this. Dependant on the results of your survey, you may choose to renegotiate depending on the seriousness of the faults highlighted. If only minor faults are highlighted (light bulbs, scratching, etc) you may choose to "take a view" on the overall package and proceed to completion. More major faults such as engine problems or those affecting hull structure may prompt you to reconsider the price you have offered. Once the deal is at a stage where both parties are happy to complete, the balance should be paid into our Client Account. The vendor will sign a Bill of Sale transferring ownership to the purchaser, and once this has been received the money will be transferred into his account. The Bill of Sale is then passed to the purchaser and he or she can take possession. Insurance cover needs to be in place at this point, please contact us if you need any assistance with getting a competitive insurance quote.